Brett (shaper) knew he was going to be a surfer from a young age. He got his first board at the age of 3. Col Smith (Morningstar) shaped it for him for Christmas. Brett did the pro-am Australian circuit for 2 years where he came 2nd overall in 1988 and then decided to do the world ASP tour for 3 years. After his major sponsor folded he decided to take up shaping. 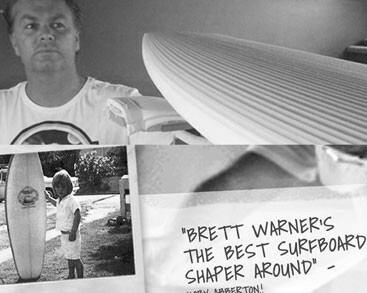 Warner Surfboards started in 1996 after 5 years shaping and learning from Greg Clough at Aloha Surfboards in Brookvale. Today his shapes are wanted by some of the best surfers on the planet. He travels the globe surfing and working with some of the greats of the industry to keep his shapes at the forefront of design and works closely with his team riders to pass on this knowledge to his customers.